Are you factoring invoices and need to record the factoring transactions on QuickBooks? 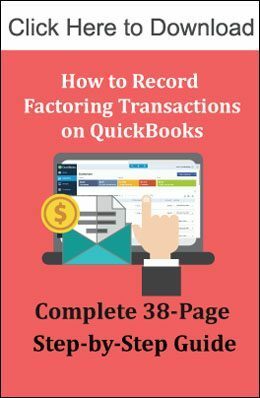 We have put together for you a comprehensive 38-page Step-by-Step Guide that includes everything you need to know about receivable factoring accounting in QuickBooks. Detailed explanation of all the accounts you’ll need to record A/R factoring transactions and instructions on how to add them to the chart of accounts. Invoice purchased: Recording steps you’ll need to take when you sell invoices to the factoring company. Factoring with Recourse: Specific entries you’ll need for recording the liability to the invoice factoring company if your company is factoring with recourse. Factored Invoices: Data entry you’ll need to perform when a factored invoice is collected by your factoring company in the case of full and partial payments. It also includes instructions on how to record discount fees paid to the factor. Non-Factored Invoices: QuickBooks entries required to record payments of non-factored receivables. Charge-backs: What accounting to do on QuickBooks when the factoring company charges you back due for uncollected amounts. Uses Direct Write-off or Allowance for Doubtful Debts Methods to write-off uncollectible debt. Factoring Expenses: How to record miscellaneous factoring account expenses such as mailing and wire fees. Factoring Administrative Fees: Steps to record administrative account fees charged by your factor, such as a factoring rate on outstanding balances. What to do when your factoring company releases amounts held in the reserve account and wires them into your company’s bank checking account. Do you like the guide? Please share this page. Do you have a different opinion on how factoring transactions should be recorded? We welcome comments and input on how to improve the content of this guide. Thanks in advance for your contributions.